Do you have outdated and worn countertops in your kitchen and bathroom? Is your grout becoming extremely difficult to clean? Interested in a remodeling option, but can’t afford costly countertop replacements? If you are looking for a money-savings alternative to replacing your countertops, surface refinishing is the solution for you. Miracle Method is the world’s largest surface refinishing company in the United States. Learn how to make your existing tile beautiful again all while fitting your style and budget. Tile counters and back-splash refinished to look like new again – and the grout is completely sealed! –Refinishing is a process of repairing and restoring existing surfaces to extend their functional life, without replacement. 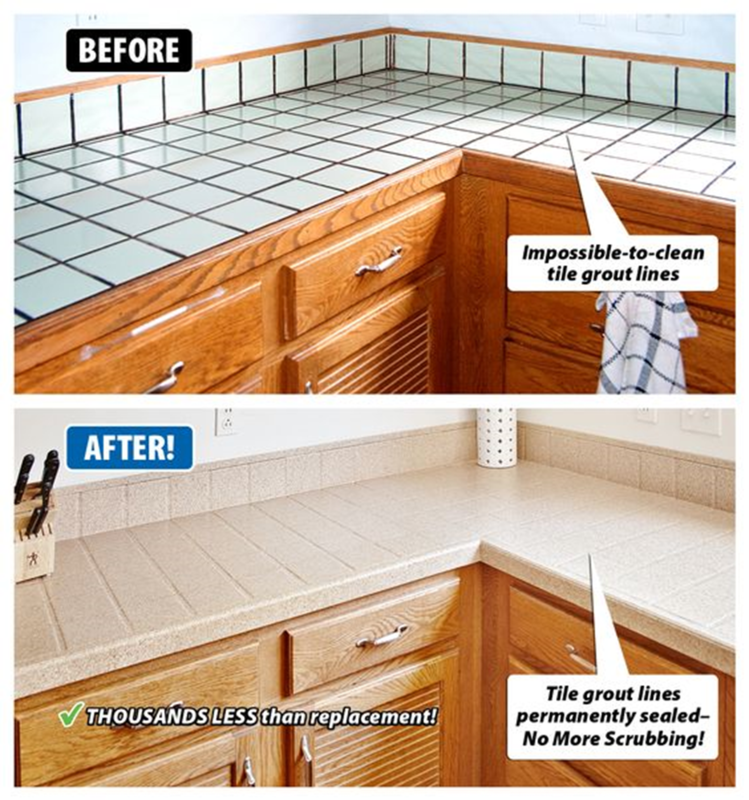 Bring new life to your existing fixtures with Miracle Method’s surface refinishing process, plus avoid the chaotic demolition mess associated with countertop replacement. On average, homeowners save up to 75% by choosing surface refinishing. Don’t spend thousands of dollars replacing your countertops, refinish for a beautiful makeover that won’t break your bank! Don’t stress over a lengthy timeline. Unlike other remodeling options, you can score the kitchen of your dream in days, not weeks. Imagine transforming your kitchen or bathroom in as little as 1-2 days. Miracle Method’s team of technicians complete the refinishing process in a timely manner, so you can start enjoying your kitchen sooner. The main goal when selecting a remodeling option is often quality. Choose refinishing for long-lasting results. Miracle Method’s service warranty guarantees quality with proper care and maintenance. Refinishing can add useful life to your existing countertop surfaces for 15 years or more, organically beautiful countertops for many years! Choosing a cost effective solution over replacement doesn’t mean you have to sacrifice an attractive countertop surface with a luxurious appeal. Miracle Method offers a real stone luster featured in our sophisticated line of Natural Accents®, a collection of countertop finishes available in a variety of colors and textures to complement all types of décor. Visit one of Miracle Method’s showrooms to see the beauty for yourself. 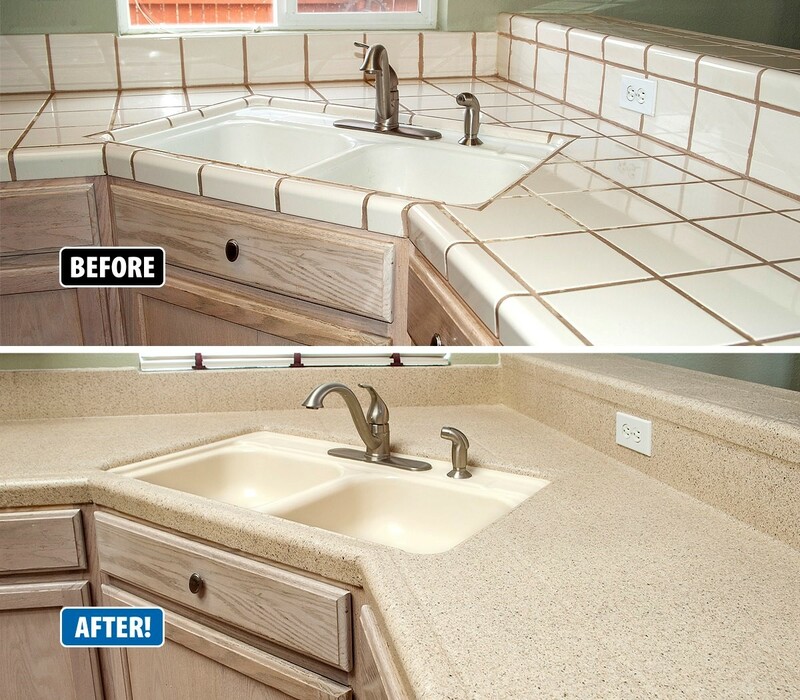 Call 855-212-7337 for a free countertop refinishing estimate or click here for more information.